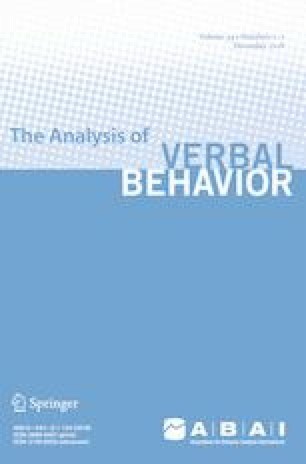 Although Skinner (1957) provided a behavioral account of verbal thinking, additional research is needed to evaluate stimuli that may influence covert verbal behavior that occurs between the onset of a verbal stimulus and the emission of a response during an episode of verbal thinking. The present investigation examined the effects of auditory distractors and/or textual stimuli during arithmetic problems and tangram puzzles on the participants’ response latency and accuracy. In addition, we measured and categorized occurrences of vocal verbal behavior during the response interval. In Experiments 1 and 2, the experimenter played auditory distractors during a proportion of arithmetic problems. In Experiment 2, the experimenter also presented a textual stimulus of the arithmetic problem. In Experiment 3, the experimenter played auditory distractors during a proportion of tangram puzzles. Results showed that auditory distractors led to longer response latencies and reduced accuracy in Experiment 1. The addition of the textual stimulus during trials in Experiment 2 improved accuracy and reduced differences in response latency when the auditory distractors were and were not present during the response interval. The auditory distractors during tangram puzzles in Experiment 3 produced no differential effects on accuracy or latency to respond. We thank Leah Bohl, Sarah Farhan, Ella Gorgan, Michelle Helms, Zhanxu Liu, Theresa Mayland, and Stephanie Zettel for their assistance with data collection.